Nothing can transform the look of a piece of furniture like a fresh coat of paint. You can take dated and worn to bright and fresh with just some basic supplies and a little time. However, it helps to keep a few tips in mind to ensure your project is a success. You can paint anything from an upholstered chair to a wood end table, but the process is different depending on the material of the piece. Knowing what you're working with is the first step in a successful paint job. This way, you can properly prepare the surface and purchase the specific paint and supplies you'll need for that item. Wood and wood veneer are some of the easiest materials to paint. You may notice different species of wood have various grains and textures. Some, such as oak, have a very strong grain. If you're going for a smooth surface, which is common with painted furniture, you may need to fill the grain with a product like AquaCoat. This type of filler is inexpensive, available at most home improvement stores, and provides a level surface for your paint. If there are significant chips in the surface, you should also fill these with putty. You can use any paintable putty like Elmer's Color Change Wood Filler. After you've cleaned the wood surface, you simply press the putty into the chips or gouges and allow it to dry. Then you can sand it and continue with your painting process. Finally, if the wood has been previously painted or stained, you will need to sand and de-gloss the surface prior to applying primer or paint. You can use a fine grit sandpaper and any deglosser, such as KrudKutter. Metal furniture is often really durable, and it's a great candidate for painting. From patio pieces to old filing cabinets, you can easily create a fun new look. The first thing you'll have to do, however, is remove any rust. Left alone, rust will cause your new paint job to bubble and flake, but you can tackle it with the right products and some elbow grease. There are chemical methods you can use, but they often give off harmful fumes. Unless the rust is really bad, use a power sander to grind it off. Be sure to keep the sander moving so you don't create an uneven surface for painting later. Start with coarse sandpaper and move to finer grits as you get close to finishing the process. For extremely rusty items, you can use a chemical method like WD-40 Rust Remover in a well-ventilated space. Even if the metal surface is rust-free, be sure to go over it lightly with fine grit sandpaper to make sure it's not too smooth for the paint to adhere. Laminate is a plastic compound manufacturers use to protect and finish inexpensive pieces. It's durable and easy to clean, but it doesn't always look the way you might want. The problem with painting laminate, however, is its smooth surface. No matter how well you prime it, it's difficult to get paint to stick. To solve this problem, you need to make the surface rougher. You can use a power sander with a fine grit paper to take off the shine on your furniture item. You'll need to go over the entire piece lightly, but you should also be careful not to sand too much. If you sand through the laminate layer or catch the edge of the laminate, you can create damage that's hard to cover with paint. Focus on giving the entire piece an even, matte finish. Wicker is absolutely lovely painted, and there are tons of beautiful antique and vintage pieces that need refreshing. You can give the piece a new look by painting it a fresh white or any fun color. However, you'll first need to remove the flaking or chipped old paint. 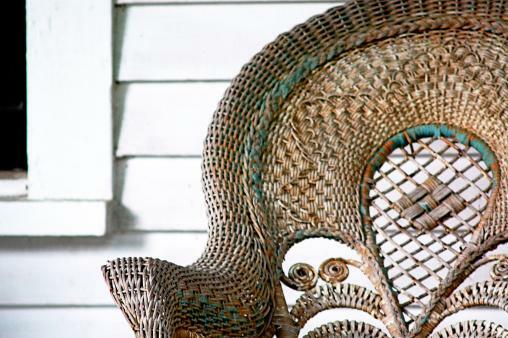 Because wicker has such an uneven surface, it's difficult to remove the old paint with sandpaper. Instead, it's helpful to use a stiff wire brush and scrub the chipped paint off. This can take time, but it's a very important step. Work a section at a time, and you'll have the whole piece ready sooner than you think. You can lightly moisten the wicker with a spray bottle of water as you work to help loosen the paint a bit; just remember to make sure it's completely dry before you move on to repainting it. Reupholstering a chair or sofa can be costly, but if the fabric is in good shape and has a sturdy weight to it, you can create a custom look with paint. This is also a fun way to update plain white canvas slipcovers or upholstery. However, oil or grease on your furniture can prevent the primer and paint from sticking properly. Fortunately, you can use a small amount of detergent to eliminate the grease. Just a dab of household dish soap can remove the oil. Remember, you don't need to get the stain itself out, since you'll be repainting. It's just important to remove any grease from the surface. Thoroughly rinse the surface and allow it to dry completely before proceeding with your painting project. Many furniture pieces have hardware like handles, hinges, knobs, or brackets. Before you begin painting, remove any of these items you can. You'll need to store them in a plastic bag or other container to help keep track of all the tiny parts. To keep from getting confused when you put things back together, use a little masking tape and a pen to label each piece of hardware with its location on the furniture. Even though each piece may look the same, there may be slight variations in the way it fits on the item. 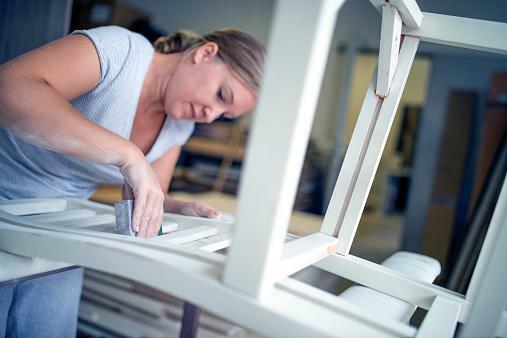 No matter what type of furniture you're painting, it's essential that you start with a clean surface. Sanding creates lots of dust, and dust beneath the paint and primer can cause your paint to peel or chip too soon. A lint-free cloth and a little water can help with some of the most obvious residue, but a tack cloth is ideal for picking up all the miniscule bits of dust that can come between your furniture and a durable paint job. You can buy a tack cloth online or at any home improvement or hardware store for a few dollars. The unique fabric picks up and traps the dust so it won't stay on your furniture. Paint is messy, and it's much easier to create a good, even surface if you aren't worrying about accidentally painting parts you don't intend. Use painter's tape to mask off anything you'd like to leave unpainted. This may include glass shelves, feet, hardware you can't remove, or sections of the item you want to leave with the original finish. Take your time applying the painter's tape to make sure your lines are straight. Use your fingernail or a scraper to press the tape down gently along the edges. This helps prevent paint from leaking under the edge of the tape. The type of paint you use and the method you use to apply it will vary depending on the characteristics of the furniture and how you plan to use it. Clean-up can also be a factor in your decision. Oil-based paint is a good choice if you need a durable, hard-wearing finish. In fact, oil has a variety of advantages, including thicker coverage with each coat and less shrinkage as it dries. Drying takes longer than latex too, which means your project might take a little more time to complete, but you'll have more time to work on each coat. However, oil can also be a challenge to clean up, since you can't pour it down the drain or wash up with water. 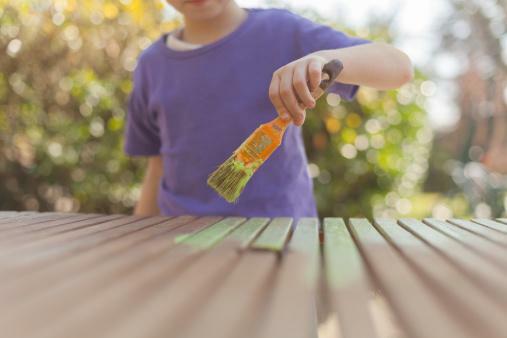 If you're willing to deal with the clean-up, oil-based paints are ideal for wood, metal, wicker, and laminate. It isn't ideal for fabric because the surface is not especially flexible when it dries. No matter which surface you have, you'll also need to purchase an oil-based primer to go with it. Choose a dark primer for darker paint colors and a light or white primer for light shades of paint. Latex paint is water-based, which means cleaning it up is really easy. You still can't pour paint down your drain, but you can easily clean brushes, trays, and other tools without worrying. It's also a cinch to get it off your hands with a little soap. In general, latex paint doesn't have the hard finish and durability of oil, but you can create a good, strong finish if you work carefully and prepare you piece well. You can use latex paint on just about any material although it's best to use a specialized fabric paint for upholstery. Latex comes in a variety of finishes from matte to satin. If you're going to need to clean the surface frequently and won't be applying a topcoat, it's a good idea to choose semi-gloss or satin. As with oil-based paints, you'll need a primer first. You can use acrylic paint on fabric if you add a fabric medium to the paint before applying it. This prevents the paint from making the fabric stiff and unpleasant to touch. It also keeps the paint from bleeding with the weave of the fabric. However, an even easier choice is a specialized fabric paint. Products like Simply Spray Upholstery Fabric Spray Paint are well-reviewed. On Amazon, customers praised this product for its soft finish and easy clean-up. It's also affordable, retailing for about $11 per can. It works best on absorbant fabrics and does not require a primer. There are lots of ways to apply paint, including spraying, brushing, and rolling. The best method for your situation will depend on the type of furniture you are painting. Foam roller - For smooth, flat surfaces like tables, dressers, and bookcases, consider using a foam roller. This gives a very even surface. Foam brush - Ideal for areas that a roller can't reach, a foam brush can mold to fit the tight spots in your furniture. It's also affordable and disposable. Traditional brush - Although it can leave brush marks, a traditional brush lets you get in between spindles or smaller details and doesn't result in as much excess paint and drip potential as a foam brush. Spray - For lots of delicate work, such as spindle back chairs or lattice work, a spray can be ideal. It requires a lot of very light coats to keep from dripping. Buy a primer that works with your paint. Generally, you'll use an oil-based primer with an oil-based paint and a latex primer with latex paint. Even if the paint says you don't need to prime, it's a good idea to err on the side of caution. It only takes a little more time to apply primer, and it can make a big difference in durability. You may also save yourself coats of paint. Your primer application method may be different than what you use with your paint. For instance, you could spray prime your furniture and then use a foam roller for the paint. Ask for advice about your specific item and paint when you are purchasing your paint and primer. The biggest goal with primer is to get a smooth, even coat. Take your time and be patient. If you hurry, you can end up with drips or streaks. Allow the primer to dry according to the specifications on the can. Then sand it lightly before proceeding. After priming, you can begin the fun part! You'll start to get a sense of how great your piece will look as soon as you begin that first coat of paint. Take your time and make the coats thin and smooth. Avoid drips as much as possible. After each coat, take a little time to sand the dry paint with a fine grit sandpaper and rub it down with a tack cloth. It can be frustrating to wait for it to dry enough to sand, but sanding eliminates drip marks or brush streaks. It gives you a smooth surface for the next coat, and the end result will be much more even and professional looking. No matter how you plan to use your furniture, durability of your paint job is important. Even gently-used items will be subjected to bumps and scrapes, so it's a good idea to add a protective top coat. There are a few options to choose from. Polyurethane is a clear product that works well with oil-based paints. However, it can yellow over time. If you don't mind a warmer tone to your piece, it can be a good, durable choice. It comes in a variety of gloss levels to suit your needs and the look you have in mind. You can brush it or roll it on, sanding between coats. For water-based or latex paints, polycrylic is a good choice for protecting your finish. It dries quickly, cleans up with water, and creates a nice, durable finish. Like polyurethane, it comes in a variety of finishes and can be applied with a brush or roller. Spray topcoats are another great choice. You can get a nice, even finish on delicate spindles and details, and it dries to be very durable. However, on large, flat surfaces, you'll need several light coats. It can be very challenging to get an even layer over large spaces like that, and multiple coats can help. Just take your time and use wide, steady strokes with the spray can. No matter which type of paint you choose, you'll love the way you can easily transform your dated, old furniture. Once you get the basics down, you can add in fun embellishments like stencils and chalkboard panels. Soon, you'll have a home full of custom furniture.